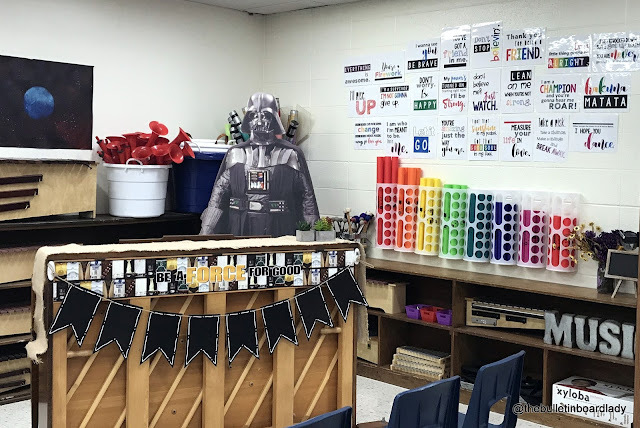 I've been waiting for years to do this theme in my classroom. My only regret is that my Star Wars loving husband isn't here to see it. I think he would be proud! This year's theme is Jedi Musicians. Let me take you on a walk through of my room. This is the front view of my classroom and what the students look at most of the time they are in their chairs. 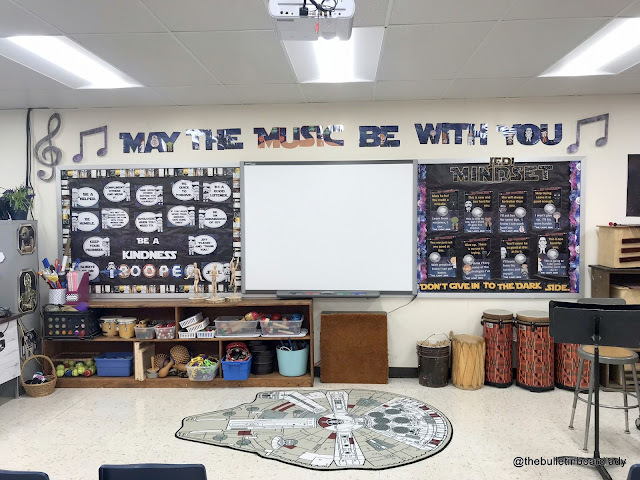 My instrument storage is easily accessible and they can easily see two character education bulletin boards and my awesome Millenium Falcon rug. 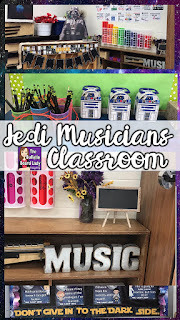 The large message across the front of the room is a bonus in the Jedi Musicians bundle. 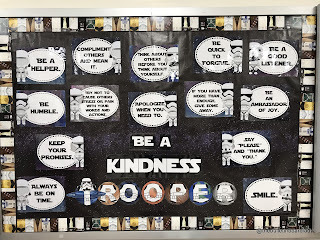 This is a closer view of the Be a Kindness Trooper bulletin board. You can snag it here. 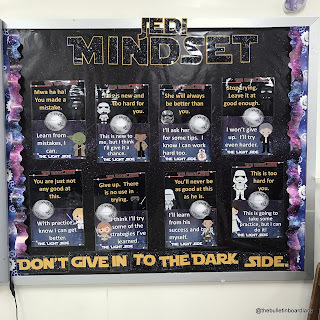 Jedi Mindset bulletin board. You can download it here. Growth mindset is something that I have encouraged in my classroom way before it was a trendy buzzword. It is important to make students feel that my classroom is one that is safe to make mistakes in and that the voice in their head is the most important one they will ever hear. This year I decided to present this in a dark side/light side. My students LOVE it! This view is of the corner of my classroom. I store my Orff instruments, Boomwhackers and some miscellaneous things (pBuzz and steady beat swords). The poster on the left is a painting that my son did. He is so talented! 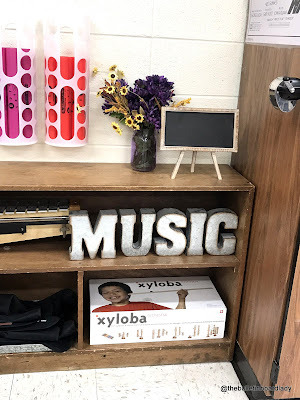 The song lyric posters are positive messages to me and my students. They sit on the wall just opposite of my desk so I see them all the time. You can get them HERE if you are interested. 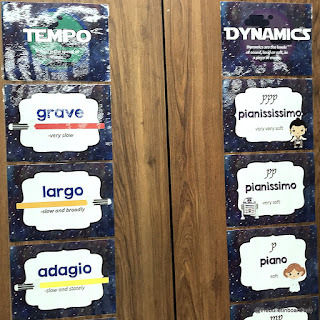 I keep a display of common tempo and dynamics terms as a reference during the school year. 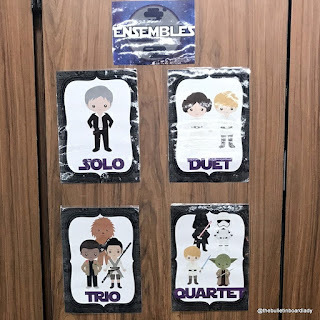 I also love to keep something up all year that reminds students of ensemble names and sizes. We refer to this during listening lessons all year. Although the picture above looks like a word wall, it is actually my instrument family display. I like being able to sort them into families in this way and love that it doesn't take up too much space. 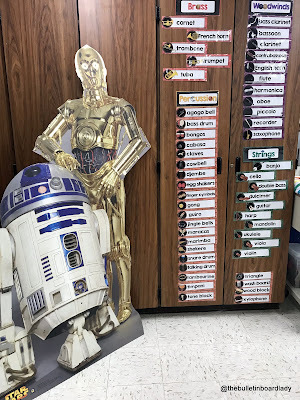 This is at the back of my room because later in the year my third graders will take some quizzes on them and it is easier to cover up there. This is the back of my room. 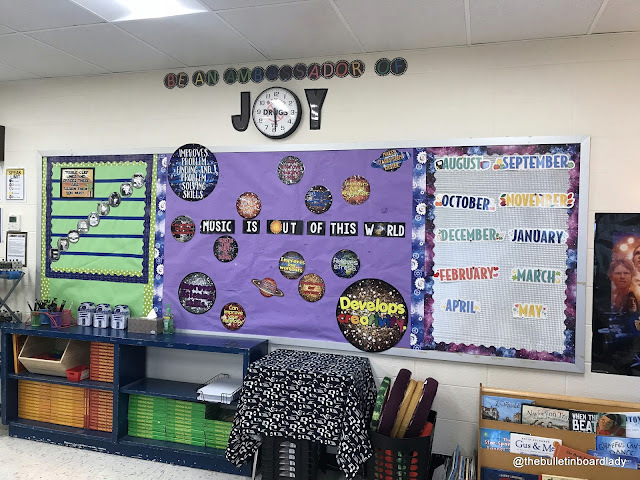 I have one long bulletin board that I divide into several sections. 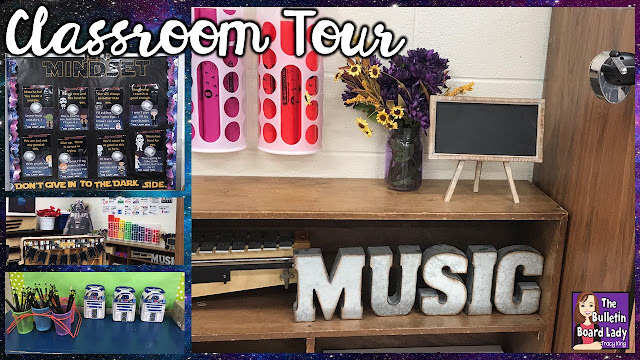 The board on the far left is my treble clef lines and spaces display. The board on the right will be my Song of the Month display and the one in the middle will be changed out monthly. These groovy borders are all from Creative Teaching Press. The shelves house textbooks I rarely use. Under the table are foot stools that I use for flexible seating and to put glockenspiels on when we play them. This makes it much more comfortable for students to play. 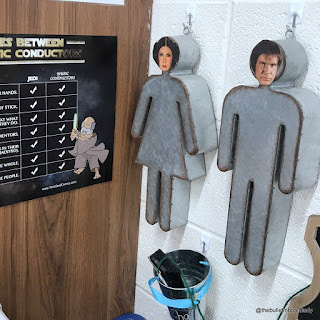 This area contains a funny picture from Tone Def Comics about Jedis and Conductors. Love it! The Leia and Han Solo people were actually left from my farmhouse theme last year. I just made them a little Star Warsy (is that a word?). We don't use them as actual bathroom passes (because...uhm...gross) but they hang near the area where students sign out to leave the room. This is my favorite corner! This is my reading area. I will use these each time we do stations. 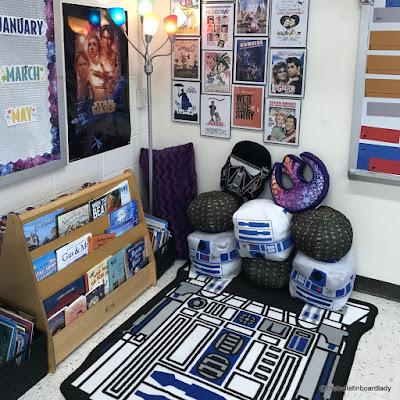 There are books in baskets on each side of the bookshelf and students are sure to be comfy with the pillows and R2-D2 rug. Heck, I might curl up there during my planning time! My desk. 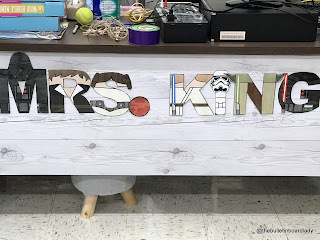 I kept the faux wood contact paper I put up last year and added these Star Wars inspired letters from Aisnes Creations. I have a cozy footstool from Five Below under my desk. If you like these ideas, PIN THEM for later.